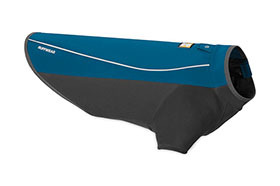 The Ruffwear Cloud Chaser protects against rain, snow, wind, and cold. Stay out longer in stormy weather when both you and your dog are protected. This is a great all purpose jacket for your pet. The upper panel is built with waterproof, windproof, breathable softshell fabric. The fleece-lined lower panel sheds water, snow, and dirt while holding in warmth. Zippered closure provides a performance fit while stretch technical fabric allows for a full range of motion. Reflective trim for safety.